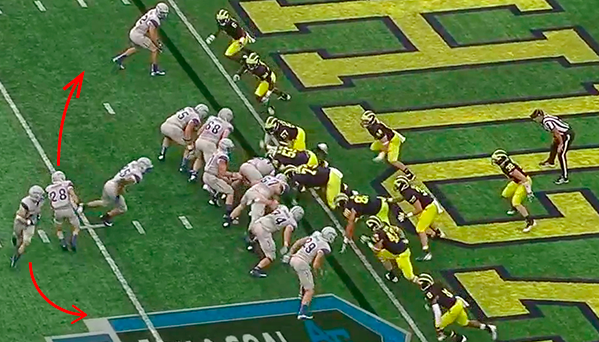 It comes as no surprises to anyone who has watched the Michigan defense the last four years, but young players make mistakes, apparently none more frequently than keeping outside leverage on run plays. The bad news is Raymon Taylor is a true sophomore in his first season of significant playing time. The good news is his biggest mistake this season came against Air Force, a play that he can hopefully learn from. It's Air Force's first possession of the second half and Denard has already run 58 yards down the field for a touchdown. The Falcons have driven the ball to the one yard line but Michigan has forced a fourth and goal. 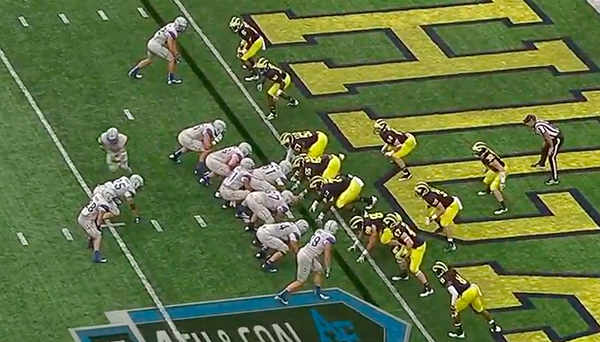 On the previous play, Air Force tried a QB sneak that failed miserably, so Mattison has called for defensive linemen to cover the Air Force center and guards. 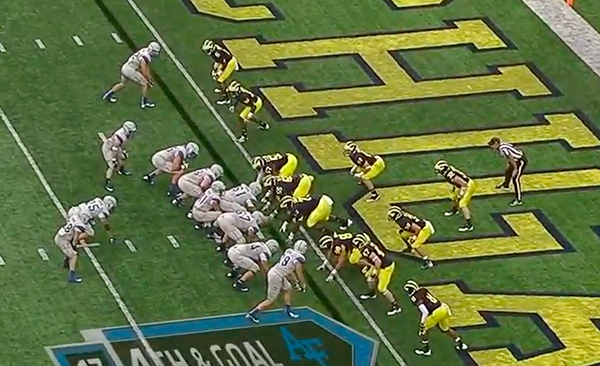 Before the snap, the Air Force H-back motions to the strongside of the play. When the ball is snapped, the H-back continues around the formation, but the running back begins in the other direction. This will be a pitch play to the running back. 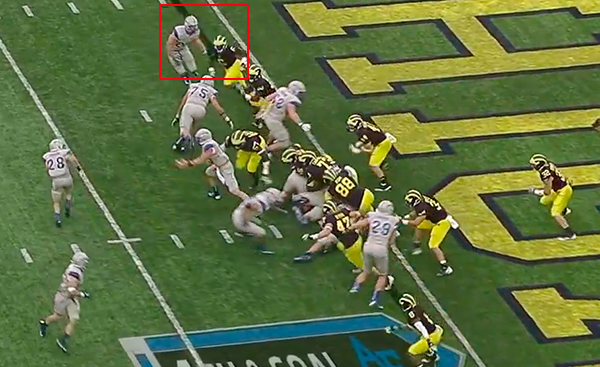 Raymon Taylor, Michigan's outside defender--the guy responsible for not letting anyone outside of the defense--unfortunately heads straight for the ball and cuts underneath the Air Force receiver who is happy to oblige Taylor the lane knowing the play is going outside. The receiver helps Taylor along (this screen makes it look like a block in the back, but it probably isn't). The Falcons' left tackle is also cutting Thomas Gordon (#30) to the ground. Taylor supermans for the tackle and misses hilariously. And without outside defenders, a field of daisies. 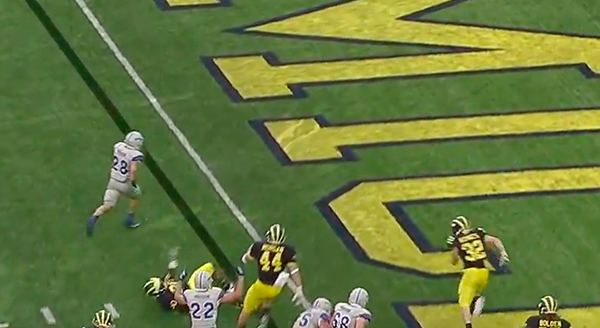 If Michigan lost this game, you can be sure I'd be irate about this play. But they won, so, wheeeee. Taylor is young and it's good that this happened against a team that Michigan beat instead of a loss in which this could have been the turning point. 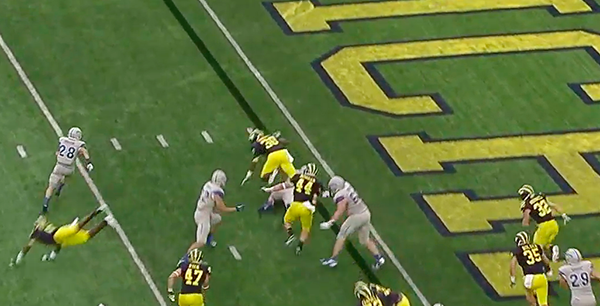 You can be sure that Mattison and Hoke sat Taylor down in the film room and showed him this play a few different times to explain that as the outer-most defender, it is his responsibility to keep everything on the inside of the defense. We'll see if he's a quick learner, but this is a pretty obvious example/mistake to learn from. Even if Taylor stayed to the outside (top) of the receiver it's clear that Gordon wouldn't have been able to make the play as he was cut down by the left tackle. Kovacs wouldn't be able to get over in time either. What if instead of blocking Taylor inside, the receiver releases into the end zone? Taylor has to cover him, Gordon is cut by the left tackle, and it's the running back vs. nobody. Basically, the defense seems doomed no matter what because there's 3 guys (RB, WR, Left Tackle) on 2 (Taylor and Gordon). The construct of the play is such that Taylor needs to funnel the RB toward the pursuit defense. If he strings the play out, that allows people like Desmond Morgan and Jordan Kovacs to flow down the line and wrap up the tackle. 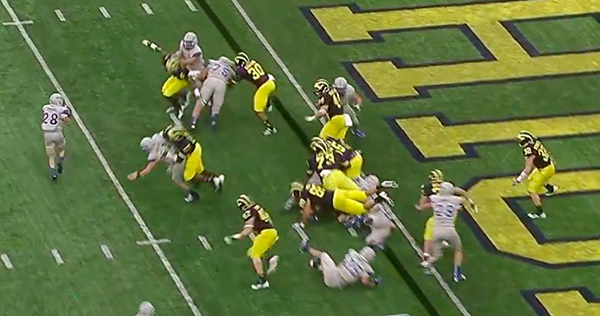 It doesn't assure that the play doesn't end in a touchdown, but the longer you're able to string out the play, the more able Michigan's backside defenders are able to flow downhill on the running back. For clarification's sake, it probably is a block in the back (as the video shows), but those are legal within five yards of the line of scrimmage. Thanks for the heads up. I was unaware of that subtlety. If I remember the rules correctly the blocking zone is a 10 (wide) x 6 (deep) yard zone centered on the snapper and the zone disintegrates when the ball leaves the zone. A block in the back/clipping is legal inside the zone. Its a close call as to whether Taylor is inside the zone at the snap of the ball; but it appears clear that as soon as the ball is tossed ( at the 6 second market) the blocking zone disintegrates. The referee should have called the penalty. Without the very clear push by #22 Taylor may have made a shoestring tackle or have forced #28 so far outside he may have gotten some help about 30 seconds after the ball was snapped. 5. Kovacs is slow to read but still coould have made the play if either Gordon or Taylor slow the play.